විධායක ජනාධිපති ක්‍රමය අ හෝසි කිරීම සඳහා ජනතා විමුක්ති පෙරමුණ විසින් පාර්ලිමේන්තුවට ඉදිරිපත් කර ඇති 20 වන ව්‍යවස්ථා සංශෝධනය පාර්ලිමේන්තුවේ සම්මත කර ගැනීම තව දුරටත් කල් මරන්නේනම් ඒ සම්බන්ධයෙන් වන අවසන් තීරණයට මැයි මාසයේ එළඹෙන බව ජනතා විමුක්ති පෙරමුණේ ප්‍රධාන ලේකම් ටිල්වින් සිල්වා මහතා පවසයි. ඒ මහතා ඒ බව පැවසූවේ ඊයේ (05) අනුරාධපුරයේ පැවති 48වන අප්‍රේල් විරු සමරු වැඩසටහනට එක් වෙමිනි. එහිදී වැඩිදුරටත් අදහස් දැක්වූ ජවිපෙ ප්‍රධාන ලේකම් ටිල්වින් සිල්වා මහතා පවසා සිටින්නේ 20 වන සහෝධනය පාර්ලිමේන්තුවේ සම්මත කර විධායක ජනාධිපති ධුරය අහෝසි කිරීමට කටයුතු නොකරන්නේ නම් පොදුජන ව්‍යාපාරයක් ලෙස ඉදිරි ජනාධිපතිවරණයට ජනතා විමුත්කි පෙරමුණ ඉදිරිපත් වන බවය. okun 20 kemathi wenne karagana deyak nethinamma vitharayi…. It is impossible to think why JVP undertook this “Contract” to abolish the “Presidency”, when they know that the present MPs are on “AUCTION” at all times when decisions are to be made. Even if 2/3rd majority is taken, according to SC decision it has to be APPROVED by the people . Do you think this would take place in view of the provisions of the 19th Amendment? In the end JVP will be “NO WHERE” and could say “ALSO RAN”. 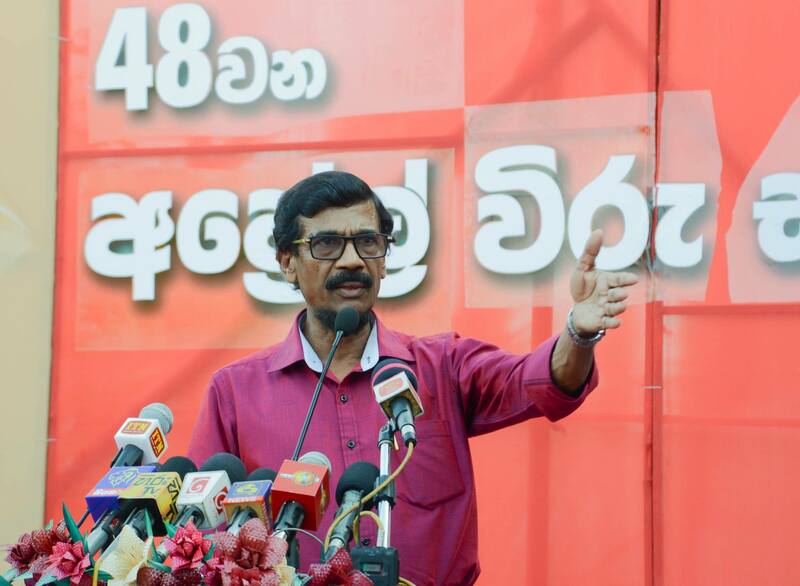 I fell this decision of JVP is committing “HARA KIRI”.